Moreton Bay, approximately 80 km long from north to south and 25 km at its widest point, lies between the mouth of the Brisbane River and the barrier islands comprising Moreton, North Stradbroke and South Stradbroke. The bay narrows at South Stradbroke, where there is a cluster of islands that turn the bay into channels and passages. The bay was concealed from Lieutenant James Cook on his epic east coast voyage (1770) until he noted Point Lookout on the north-eastern tip of North Stradbroke Island. Moving north Cook saw what appeared to be a wide bay which he named after the past President of the Royal Society, Lord Morton. Hawkesworth, the editor of Cook's journals rendered it as Moreton. Matthew Flinders found the passage between Stradbroke and Moreton Islands in 1799 and named the northernmost one in accordance with Hawkesworth's spelling. Stradbroke Island and the populous Russell-Macleay cluster of islands in the south of the bay are described in separate entries. 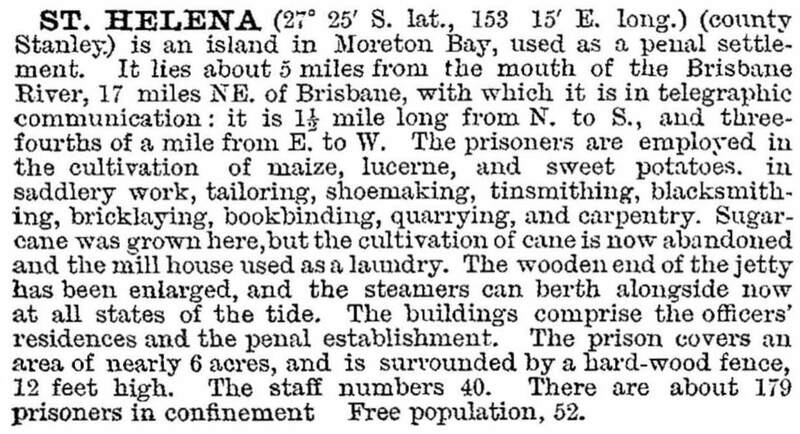 This entry describes Moreton Island, St Helena Island, Peel Island, Coochiemudlo Island and the bay in general. The prison was closed in 1932 after the male penitentiary was opened at Dutton Park (Boggo Road Gaol). Made a recreation reserve in 1933, the island was used for grazing, and buildings fell into decay. Restoration work began in the 1970s and the island became a National Park in 1979. Peel Island, named by John Oxley in 1824 after Sir Robert Peel, Secretary of State for the Home Department, is 5 km east of Cleveland Point. It is a sandy island lying on corals which have been mined for building lime. European settlement of Peel Island began in 1874 when it was made a quarantine station, taking over that role from Dunwich on North Stradbroke Island. In 1906 the quarantine station closed and the next year a lazaret (hospital for incurable diseases, mainly leprosy) was built, consisting mostly of two-bed cottages. After the lazaret was closed in 1959 there were several unsuccessful attempts at tourist development on Peel Island and finally an area with most of the buildings was leased to the Anglican Grammar school for educational camps. It later came under the management of Redland Shire and the State Department of Natural Resources. The buildings are listed on the Queensland heritage register. Moreton Island is mainly a sand formation swept up against the sandstone Cape Moreton at its north-eastern point. Mount Tempest (280 m) near the middle of the island is considered to be the world's largest sand dune. When it was found unsafe to enter Moreton Bay between Moreton and North Stradbroke Islands, a route around the northern end of Moreton Island was taken. This necessitated the building of a lighthouse at the north-west, Coomboyuro Point, on the island (1848) and the opening of a pilot station at Bulwer, three kilometres south. Ten years later the rough-faced sandstone lighthouse at Cape Moreton began operation. It is listed on the Queensland heritage register. By the 1920s there were seven lighthouses or beacons in operation, since reduced to two: Cape Moreton, and the nearby North Point concrete tower (1939). In 1952 a whaling station was opened at Tangalooma, about midpoint on the western shore, running for ten seasons. In 1962 the site was converted to tourist accommodation. It has been moderately successful, in no way emulating the commercial brashness of mainland resorts. Access is by boat from Redcliffe. Coochiemudlo Island, originally named Innis Island, appears to have had its Aboriginal name restored in the 1880s. The name is believed to have been derived from an Aboriginal expression describing the red soil and rock common to both it and Victoria Point on the mainland. The distance between the two is one kilometre. In 1885 allotments on the island were offered for sale and some farming was taken up, mostly fruit and vegetables. The gardens and the stands of healthy trees gave the island considerable charm, making it a popular day-trip and holiday place in the 1930s. A golf course was laid out on the south-west of the island. In 1961 Coochiemudlo was the first of several Moreton Bay islands to be residentially subdivided. A proposed skyway cable-car from Victoria Point (1988) fell by the wayside. The estimated population of 70 and weekend visitors (over 1000) seemed content with the ten minute voyage by boat. There are beaches on the island's south side (where the jetty is found) and the eastern and northern sides. Coochiemudlo Island has a church, a general store, a hall, a reserve, a surf life-saving club, a golf course, and a white-fella midden of car bodies near the rubbish dump. Tree protection regulations (1993) have improved the state of native vegetation. The island is in Redland City, and in 2011 it had a census population of 708. Moreton Bay has a substantial marine park (1993), with a highly varied ecology. Much of the shoreline is mudflat and mangrove, with off-shore sea grass beds, particularly near South Passage (between Moreton and Stradbroke Islands) and southwards from St Helena Island. The sea grass supported dugong herds which were fished until 1920. Whales were hunted (1952-62), and there are resident dolphin pods. The sea grass is a nursery for prawn populations. The mudflats, some of which are fertilised from sewage outlets, accommodate populations of migratory and water birds. Near the mouth of the Brisbane River are Bishop and Fisherman Islands. Bishop, formed from material dredged from Brisbane River during 1909-12, became a popular recreation spot. In 1976 the Brisbane port expanded downstream, taking the islands for modern facilities, and a standard gauge railway line was extended from Wynnum in 1976. The reclaimed island has been formally known as Port of Brisbane since 2004. Industrialisation of the river mouth avoided the removal of some of the mangrove communities.